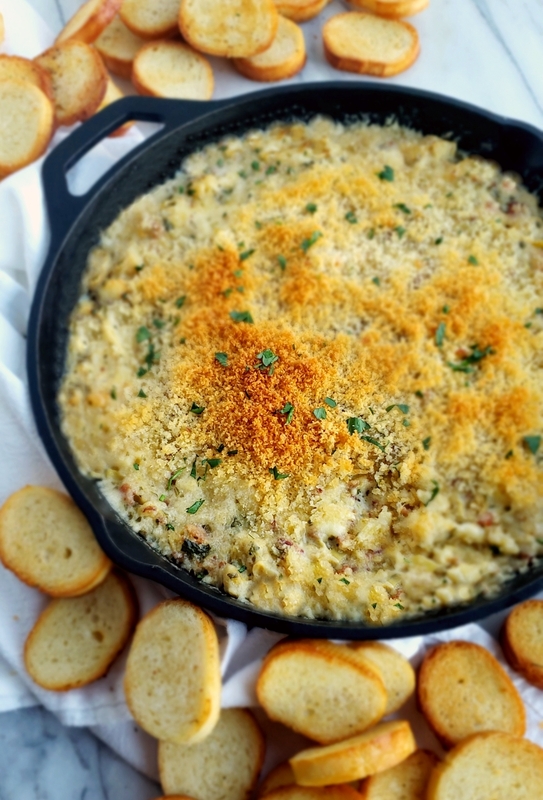 Buttery Brie cheese covered with a layer of baked bread crumbs reveals a hot dip packed with crab, artichoke and bacon. It doesn’t get much better than this Warm Brie, Crab and Artichoke Dip! 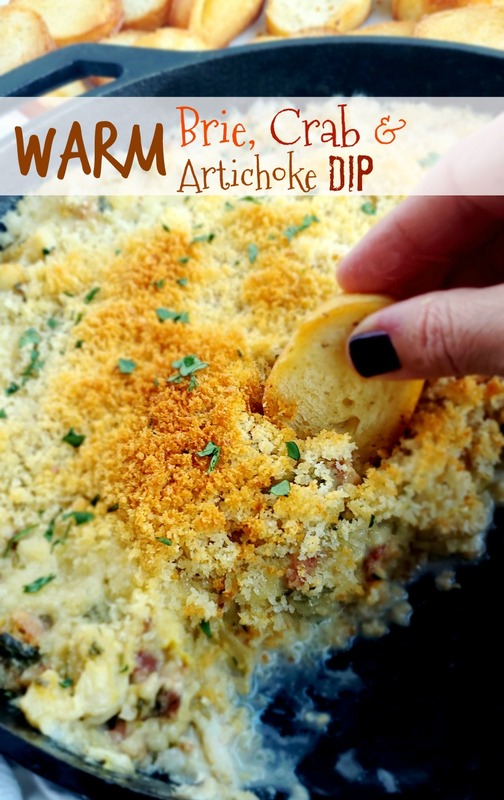 Dip season is in full force and hot dips like this Warm Brie, Crab and Artichoke Dip are perfect to serve on cold nights or chilly afternoons. Let’s not even mention how hot dips are even more appropriate and expected at holiday gatherings. This particular Hot Crab Dip and my Warm and Creamy Bacon Dip have seen many a holiday appetizer table! Yes you can easily make this ahead of time. The recipe in total takes under an hour to make. However, it can be prepared and chilled for up to a day ahead of time. Before serving, remove from the fridge and let sit on the counter for about an hour. Add the panko bread crumbs right before placing in the oven and bake. Since this dip is dairy-based, it will generally last 3-4 days in the refrigerator, assuming it has been continuously refrigerated. You can easily reheat small portions in the microwave to enjoy at your leisure. This dip tastes best when eaten with bread. Slice and toast a baguette you have brushed with olive oil. 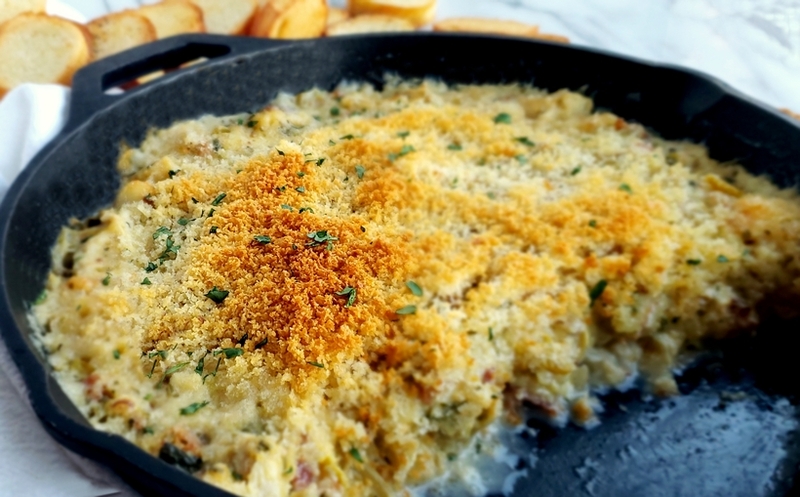 Buttery Brie cheese covered with a layer of baked bread crumbs reveals a hot dip packed with crab, artichoke and bacon. It doesn't get much better than this Warm Brie, Crab and Artichoke Dip! Preheat oven to 400 degrees F. Spray a 10" cast iron skillet with nonstick spray. Saute onion in 3 teaspoons oil in a nonstick skillet until soft; about five minutes. Deglaze with wine, simmering until almost evaporated. Stir in artichokes and cream simmering one minute. Reduce heat to low and add Brie in batches, stirring until melted and smooth. Off heat add Dijon, lemon zest, lemon juice, parsley, tarragon and bacon. Spread crabmeat in the cast iron pan and top with Brie mixture. Toss panko crumbs with remaining oil together in a bowl and sprinkle over cheese. Bake until dip is bubbling and topping is golden, about twenty to twenty-five minutes. Serve with toasted baguette. I love the make ahead tip! I’m making this fabulous dip again for a holiday party next week! This was SO GOOD! Great ingredient combo! I love the ultra creamy brie with the crab! Such a delicious dip. Disappeared in less than 15 minutes. SO good! My family really love this! So good! Obsessed- this dip is fabulous!